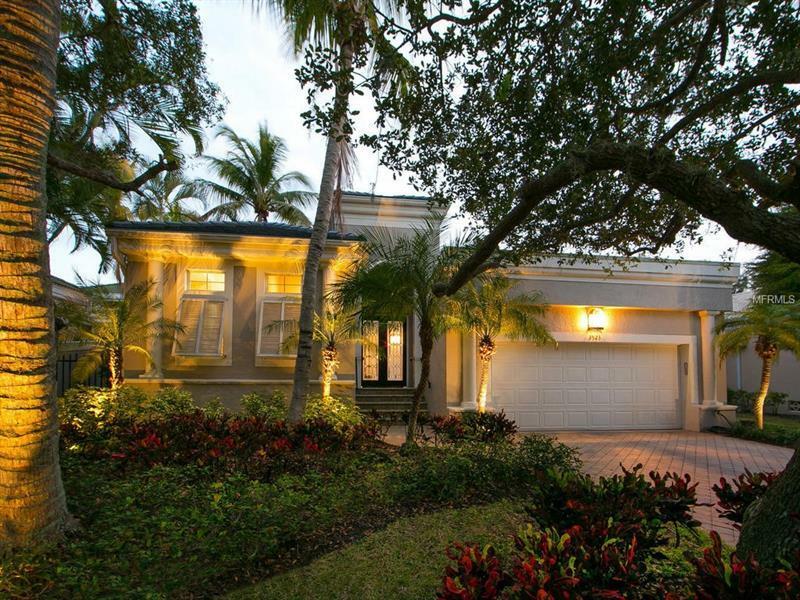 Lifestyleâ¦ luxuryâ¦ Longboat Keyâ¦Discover it all in this immaculately kept courtyard-style home in Queens Harbour, one of the most sought-after communities on Longboat Key. Nestled in a private, lushly landscaped setting, the gorgeous courtyard pool entrance welcomes you inside to the beautifully designed, sophisticated southern-style interiors. Expansive 12â -14' coffered ceilings with extensive glass windows and transoms create a bright and spacious ambiance. Wood grain ceramic tile leads the way to the living room, where seamless aquarium windows allow the outdoors in for an abundance of natural light. Follow through stately architectural columns to the dining room, which boasts a dome shiplap ceiling detail and golf course views. Perfect for entertaining, the kitchen features all-quartz counters, a large central island, GE Monogram stainless-steel appliances, a wet bar with wine refrigerator and an eating area. With a split bedroom plan, the master suite is a private retreat with a soaring coffered ceiling, an office, his and her walk-in closets, and master bath with double sinks and Silestone counters. Guest accommodations include a guest bedroom with en suite bath and a charming casita, which is separate from the main residence but joined by the courtyard. Queens Harbour offers residents a world of exciting amenities, including deeded beach access and the opportunity to join the Longboat Key Club for golf and tennis. Additional Water Information: Bay Isles Beach Club provides deeded beach access with private showers and restrooms.